Folkmanis 2920 - The critically endangered Leatherback Sea Turtle is the largest of all living sea turtles. 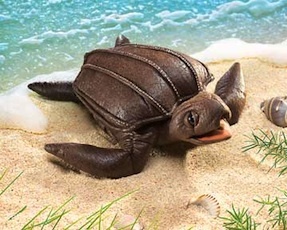 The LEATHERBACK SEA TURTLE PUPPET features a brown screen printed shell and a movable mouth and flippers. Make her dive for food or crawl up the beach to lay her eggs. Measures 12" x 9" x 4".